The mission of the Society for Neuroscience in Anesthesiology and Critical Care is to advance the art and science of the care of the neurologically impaired patient. 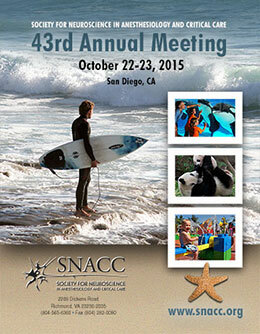 The overall scientific program of the SNACC 42nd Annual Meeting addresses the specialty's practice gaps and underlying educational need in multiple areas, including development, design and conduct of a clinical research project, as well as anesthetic concerns in emergency situation and their relationship to neurosciences from the basic science perspective through clinical workshops. A workshop will address the current gap in the anesthesiologists' knowledge about intraoperative monitoring of the nervous system. There will also be lectures on the novel topic of application of genomics in neuroanesthesia and important updates on intraoperative catastrophes and anesthesia in the neurointerventional suite. This aggregate reflects the diversity of the specialty and the needs and interests of the general and sub-specialist anesthesiologist's practice. 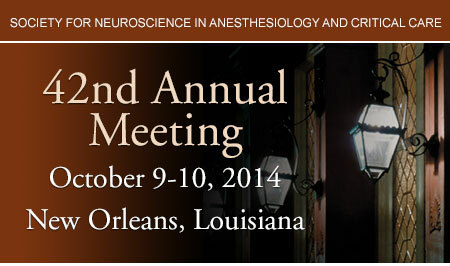 The moderated posters will reflect experimental and clinical neuroscience. The SNACC 42nd Annual Meeting has been designed to meet the educational needs of neurosurgical and critical care anesthesiologists and neuroscientists involved in the care of patients with neurological disorders and is intended for neurosurgical and critical care anesthesiologists, neuroscientists, faculty, residents, fellows and medical students. The Society supports the attendance by members in the educational sessions of the annual meeting. The program is generated from member requests and an assessment of need by the program committee. Attendance at this meeting does not guarantee competency or proficiency in the performance of any procedures which may be discussed or taught during the course. CME activities may include the following formats: plenary sessions, lectures, moderated poster discussions, oral abstracts and skill-set workshops. Attendance shall be open to all health practitioners, provided that they have registered for the meeting. CME credit will only be offered to MDs, DOs or equivalent. A completed Physician Verification of Attendance form must be submitted at the conclusion of the meeting. The information provided at this CME activity is for continuing education purposes only and is not meant to substitute for the independent medical judgment of a healthcare provider relative to diagnostic and treatment options of a specific patient's medical condition. The CME activity is supported by educational grants. A complete list of supporters will be published in the program syllabus. The American Society of Anesthesiologists adheres to ACCME Essential Areas, Standards, and Policies regarding industry support of continuing medical education. Disclosure of the planning committee and faculty's commercial relationships will be made known at the time of the activity. Faculty are required to openly disclose any limitations of data and/or any discussion of any off-label, experimental, or investigational uses of drugs or devices. In accordance with the ACCME Standards for Commercial Support of CME, the American Society of Anesthesiologists has implemented mechanisms, prior to the planning and implementation of this CME activity, to identify and resolve conflicts of interest for all individuals in a position to control content of this CME activity. In order to receive CME credit, participants must sign-in to the ASA Education Center, review the CME information and complete the evaluation. Instructions will be made available to each participant during the Annual Meeting.